Who says that on a ketogenic diet you have to eat tons of meats and spoons full of plain butter can’t be more wrong. High-fat Keto Alfredo Zucchini Noodles are so easy to make and perfect for lunch. Zucchini, also called courgette is a perfect vegetable to eat on a ketogenic diet because is super low in carbs and nutrient dense. 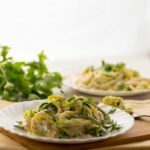 Whether zucchini is or not in season, a meatless zucchini noodles keto gluten-free pasta alternative is always a great idea. You may know that in a ketogenic diet you should keep an eye on the electrolyte intake. Zucchini provides 295 mg potassium and only 3 grams carbohydrates per cup. It is well known that zucchini is great for maintaining an optimal health and helps with weight loss, protecting against infections and many cardiovascular diseases. 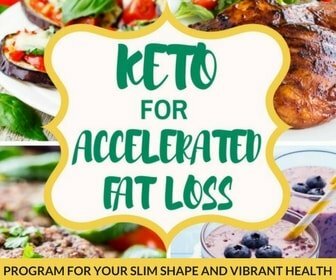 A spiralizer is a tool used by many people in the keto community because it’s fairly easy to use and clean. You get different blades, so you can make different shapes of zucchini noodles without much effort. 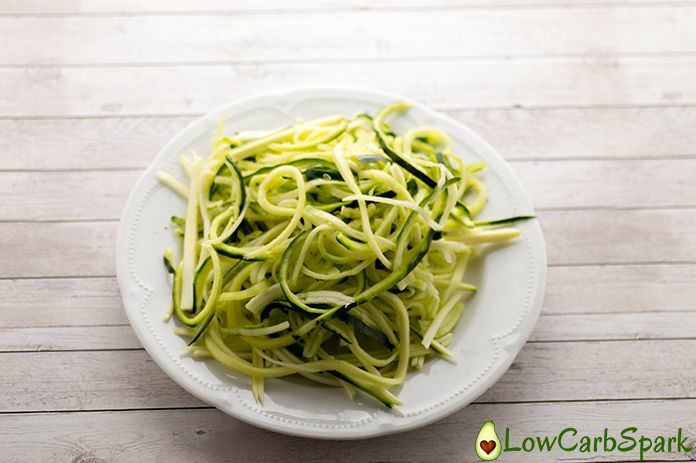 Just cut the zucchini ends, place it on the spiralizer and turn the handle to make zucchini noodles. 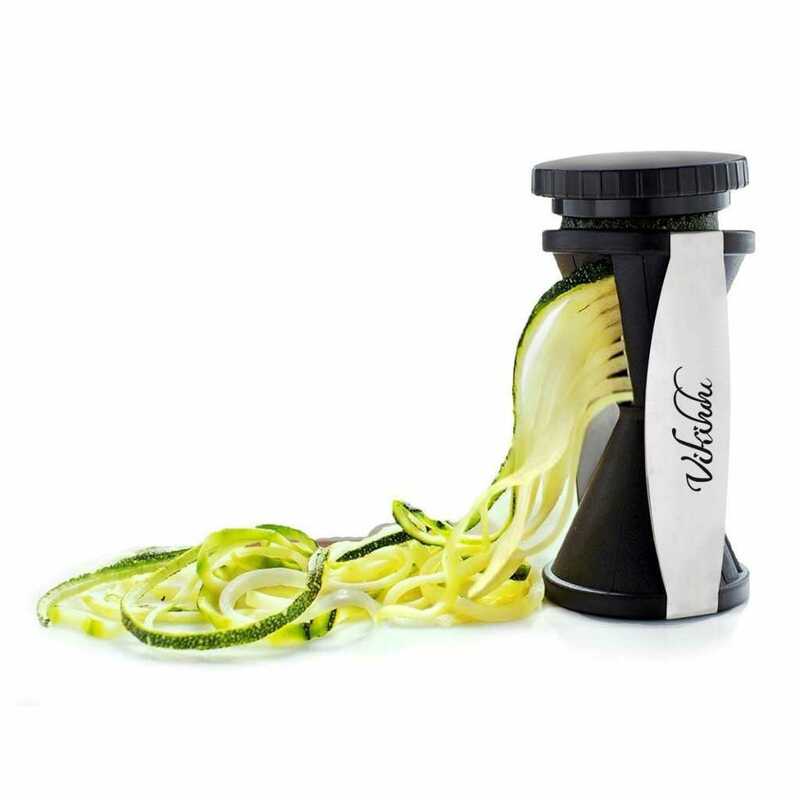 Using this tool make the perfect zucchini noodles, so it’s worth investing in a high-quality spiralizer. Looks like a potato peeler but has small teeth on the blades that will help to cut the vegetables into thin strips. It is a more affordable tool and you might already have it in your kitchen. With this one, you will exercise your arm a lot. I used this cheap gadget to make the zucchini noodles in the recipe I am going to share with you today. To be honest, it was the first time using it. I’ve seen so many people being amazed by it so I had to give it a try. 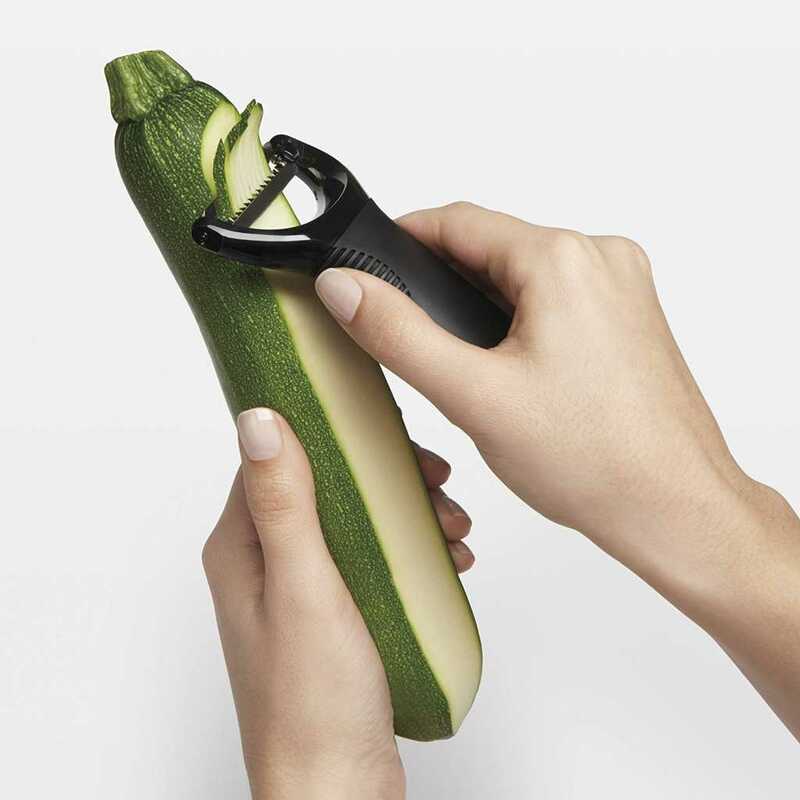 It does it job, meaning it turns zucchini into noodles but you need to put more effort than with the other tools. I am pretty satisfied with the results. How to make perfect zucchini noodles? What I love to do after I have the noodles is to sprinkle 1 tablespoon of pink salt and toss to cover well. Let them sit for at least 10 minutes. The salt will draw out some of the moisture and will make the vegetable pasta less soggy. Then I place them in a salad spinner to get rid of as much liquid as possible. This is such a genius tip. The next important step is to sauté the keto noodles in 1 tablespoon olive oil or butter for just a few minutes. 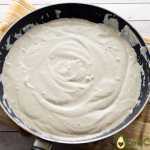 Once you’ve done all the steps, it’s time to prepare the rich and creamy keto Alfredo sauce. The serving size is 1/4 cup Alfredo sauce with 1 cup zucchini noodles. High-fat Keto Alfredo Zucchini Noodles are so easy to make and perfect for lunch. 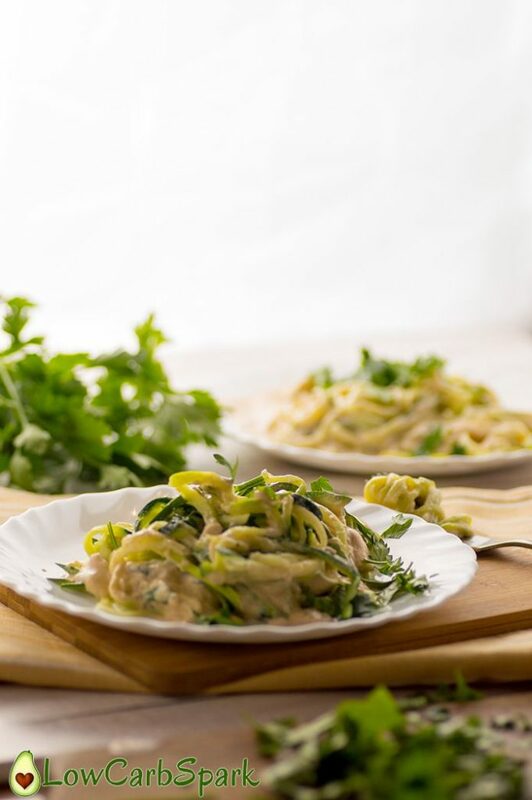 Healthy spiralized zucchini with a touch of a creamy keto high-fat Alfredo Sauce is one of the best keto meals you can have for lunch. Also great for a keto vegetarian. Melt the butter in a medium non-stick pan over medium-low heat. 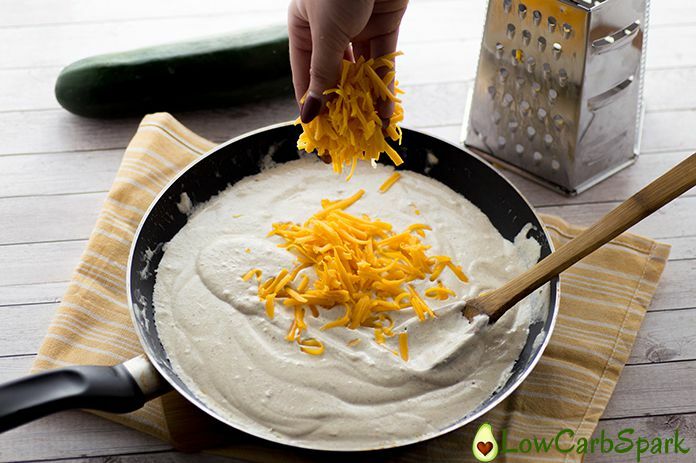 Add the cream cheese and heavy cream and mix well to incorporate the ingredients. 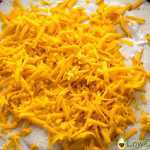 Mix in the cheddar cheese or parmesan cheese. Add in the garlic, the fresh parsley and seasoning to taste. Serve 1 cup of zucchini noodles with 1/4 cup Alfredo Sauce. I made this tonight and OH MY GOD it was delicious. I thought the zoodles would be soggy, but they were perfectly al dente and the sauce was super delicious with the raw garlic in it. I am so happy you liked it. It's one of my favorite recipes. Thank you for the kind comment! This absolutely fabulous! Can’t wait to make it again! I very happy you liked it! Best Alfredo sauce I have ever had! Soooo goood! Do you think I could freeze the sauce? I have extra! This is such a versatile sauce, love it! I used it for Alfredo over zoodles the first night, spread for my sons toast the next morning, dip for keto breadsticks, and still have some left to get creative with tomorrow- super yum, thanks! I think the carb info might be a little off. I came out with about 3 cups of alfredo sauce. The whole 3 cups should have about 30.4g of carbohydrates total, so 1/4 cup of the sauce should come out to about 2.5g of carbs. 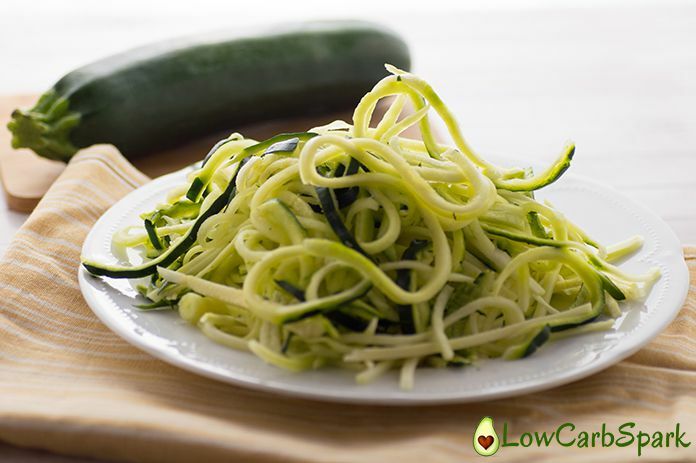 And 1 cup of cooked zoodles (i.e., about one medium size zucchini) has 6g of carbohydrates. That’s 8.5g of carbs total. 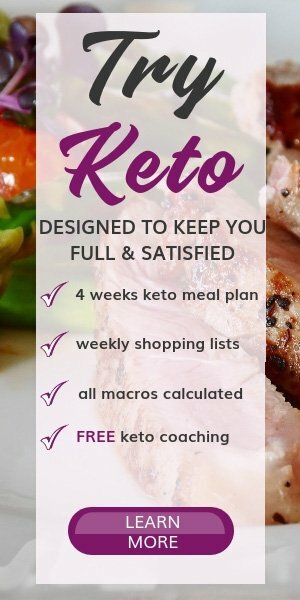 It’s a small difference, but I’m finding that sometimes small differences can matter for keto dieting. How the alfredo sauce comes out to 30.4g carbs in total: 10.4g in the 8oz cream cheese, 6g in the 6oz cheddar cheese, and 14g in the 2 cups heavy cream. The nutritional info on these things per *serving* often leaves out carbohydrate content because the serving sizes (which are usually quite small) only have 0.5g of carbs or less, which allows them legally to round down in the nutritional info display. This is one of the first recipes on this blog, so I’ll have to revise the macros. Thank you for this comment. 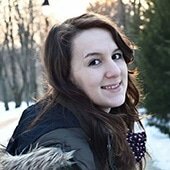 It might be beneficial for other people! !